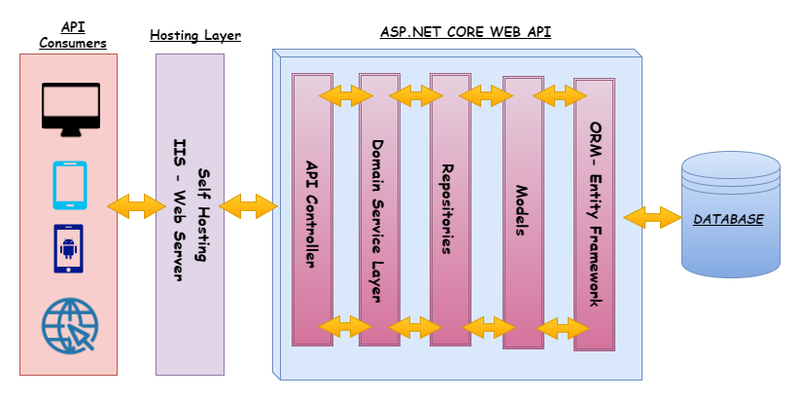 Below is the high-level architecture and data flow diagram of Web API. 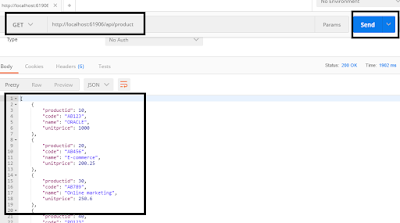 Let’s take an example of ABCSoftware Company which need to expose the API to provides the related software Product information like ProductName, Price, details etc. 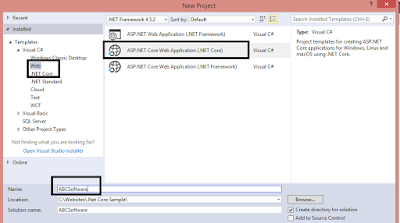 NOTE: we can either create a .NET Core Web Application which targets .NET Core or a .NET Core Web Application which targets the full .Net Framework. 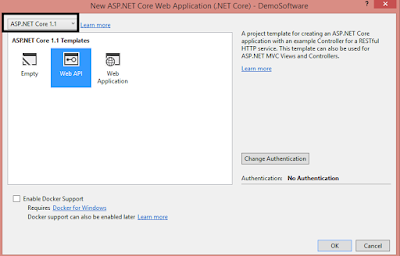 If you target .NET Core, then you can run the app anywhere that supports .NET Core (Linux, Mac, and Windows). 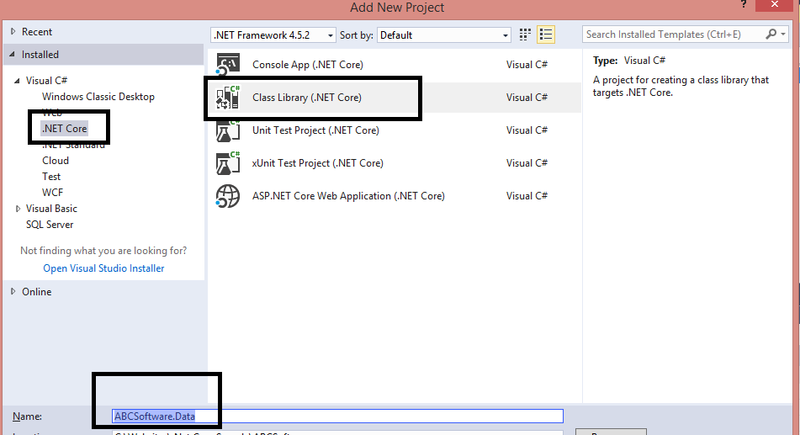 Alternatively, you can target the full .Net Framework. 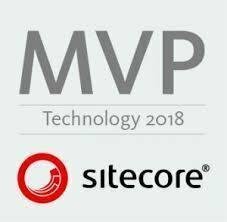 You’ll be limited to Windows (for hosting) but can use any third party library and everything that exists in the framework. 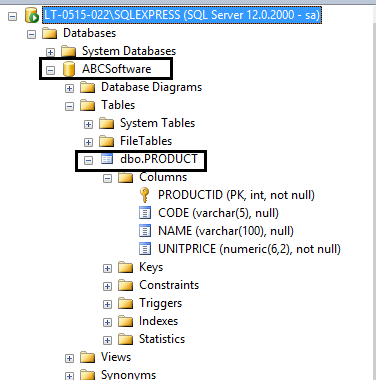 ABCSoftware.Data: This is Data layer which is responsible for all database related tasks. 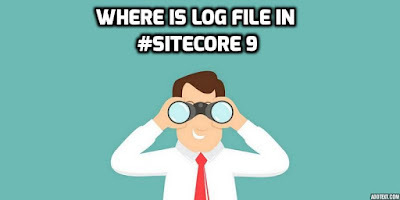 The purpose of this layer is the direct access to the database. It’s the only layer responsible for communicating with the database. If some other layer wants to access the database, then this will be done through some of the classes (repositories) we will define in this project. 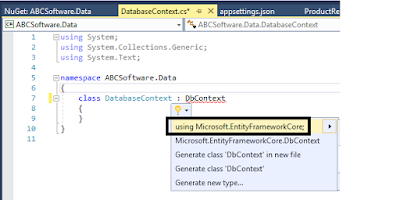 Also, we will create the Repository/ DBContext in this layer only. 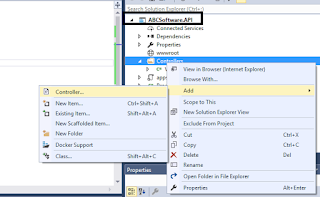 ABCSoftware.Model: We will keep all of our domain objects in this library. 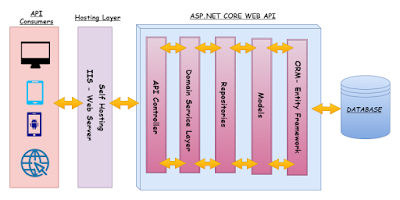 ABCSoftware.Service: This Layer is responsible for all the operation that need to expose in the MVC controller, all the Business Logic will go in this layer. This layer will directly be communicated to the Controller. 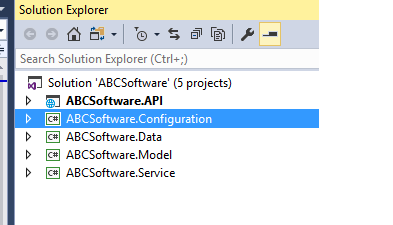 ABCSoftware.Configuration: This library is where we will keep all the configuration and the settings of the project. 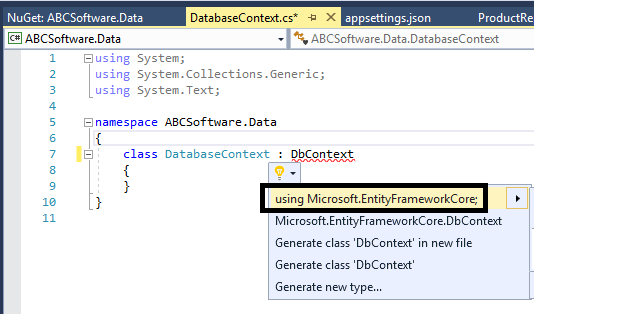 Oops, DbContext is not resolved, Yes, Now Time to install Entity Framework. 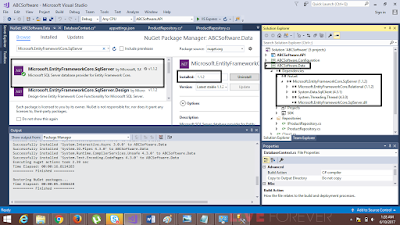 ADD Entity Framework Core reference from Nuget in Data Library Project. 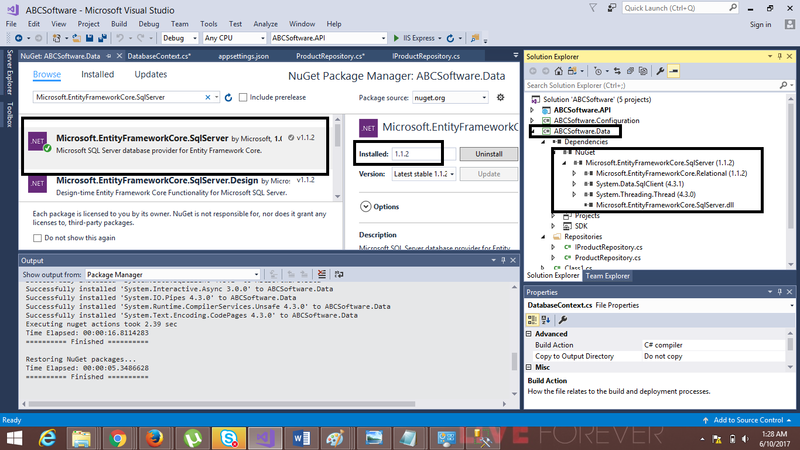 To install the package, just right click on the project ABCSoftware.Data and then, select "Manage NuGet package". 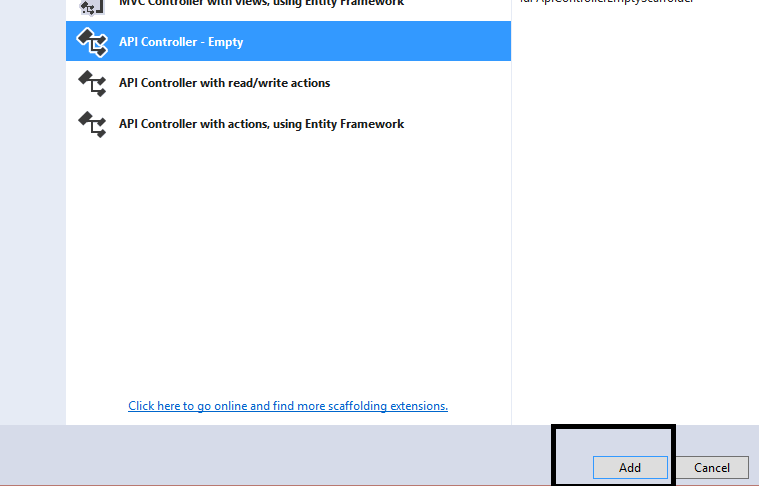 The below dialog of Nuget Package Manager will pop up. In the Browse tab, there is a search box. 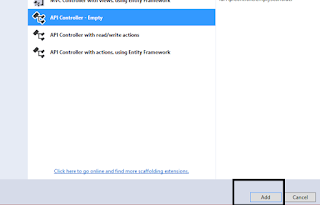 Type “Microsoft.EntityFrameworkCore.SqlServer” and just click on "Install" button to install. 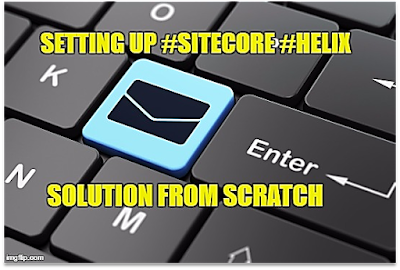 Now our data layer is completed, repositories have been created, let's create the service layer. 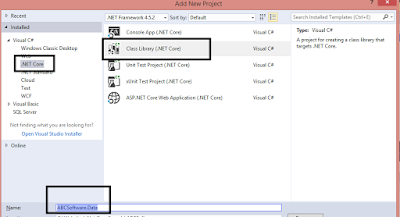 This Service layer will call the repository class in the data layer as the above code. 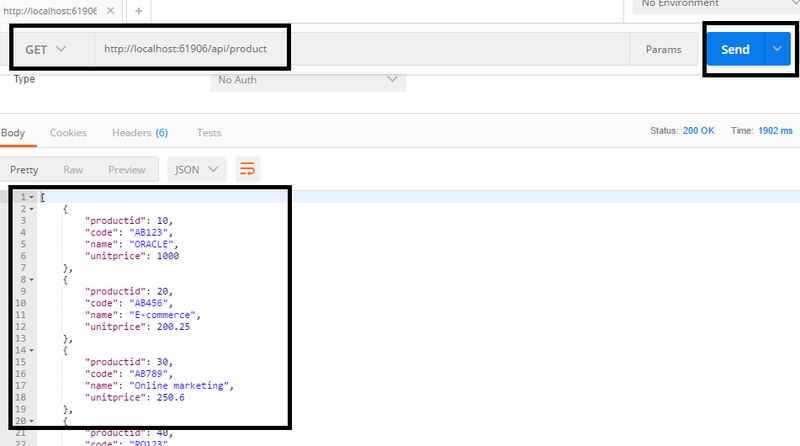 And IproductService exposed only one method called GetAllProduct() and will call by controller class. 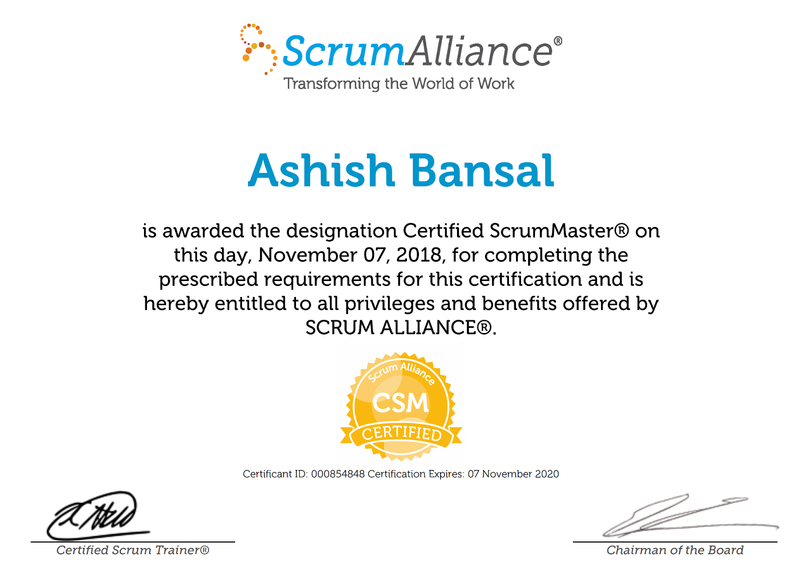 Now, everything is done!! 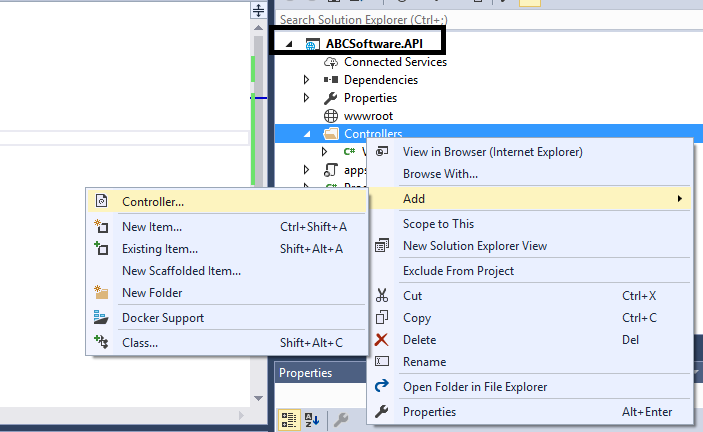 Let’s Execute the API to test..
Now all dependency will resolve through the common function called RegisterDependency from DependencyResolver Class, This is a Just example of SOC(Separation of Concern) and also no need to get reference of Data Project directly in the ABCSoftware.API Project. 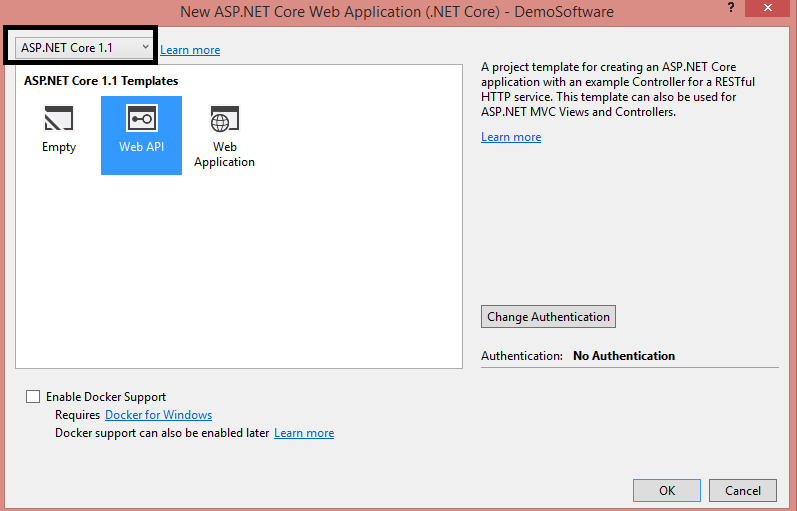 Testing ASP.net core Web API (HTTP request) Using Postman. 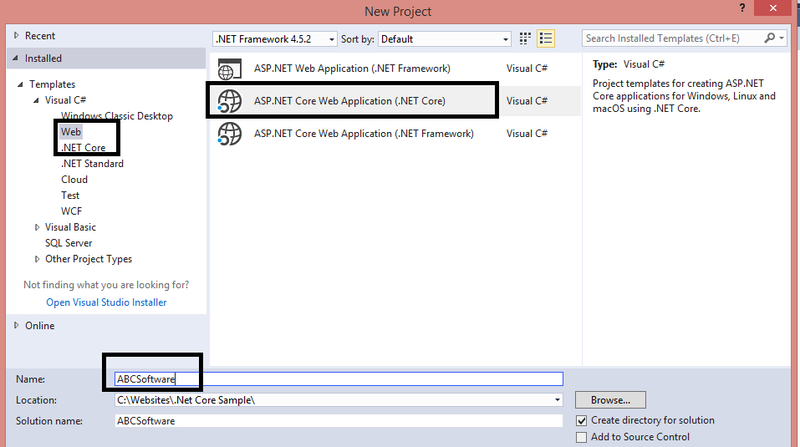 I hope this article will help you to understand the Web API concepts using .Net Core.